Stop laughing. I'm not . Usually. I like to behave and follow the rules, but I don't follow EVERY single thing everyone does. At the gym, they have had a sign on the door for months saying that we need to take off our "outside" shoes before going into the gym because all the wet stuff ruins the machines. I totally get that. The entryway from the door through the lobby and into the locker room is all fardwood, so I usually walk to the locker room in my "outside" shoes and change there. If it's not especially wet out, I might even just keep the very same shoes on! But don't tell! Since it's February vacation here, I, like the rest of the gym sheep, have taken advantage of going to morning classes. They are foolishly packed like sardines during these vacations so I have no idea what possessed me, but I've done it twice this week. It is nice to get my workout done for the day and not think about it looming ahead of me all day long. However, my body prefers afternoon exertion, so early morning stuff gets my heart rate up faster than a 4:30 could ever do. On Monday, I walked in with my super hot boots on, saw the sign, and started to march my way across the fardwood. Out of the corner of my eye, I saw something along the lines of this. 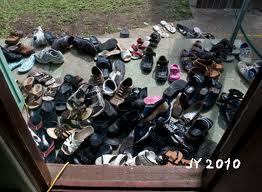 Ok, maybe not quite that many shoes, but it dawned on me that the morning gym rats are rule followers! They actually sit down (there have been chairs there all along, who knew?) and take off their "outside" shoes and put their "inside" shoes on right there at the door before setting foot past the main desk. There were a million Uggs, slip ons, flip flops, you name it. It was really all I could do not to wrap the rug up around all of them and burn those effing Uggs. And I left my fabulous watermelon boots on the mat, just like everyone else. It felt kind of good to follow the rules because everyone else did too. In the locker room, I heard some of the afternoon non rule followers who had come for morning classes mumbling "great, what did I do with my shoes- OH YEAH I left them at the door!". So it's not just me. Other afternoon gym rats followed the rules too. As I was leaving a woman came dashing back in- to grab her Uggs because she'd worn her sneakers right out the door. Hmm, she must have been an afternooner in for a morning class and lesson on how to take off your shoes and leave them at the door. I went again this morning and wore some slip on Keens. I thought I'd blend in a little more. I was kind of excited to be in the realm of the rule followers. So, I walked in the door, sat down on the chair and saw one lady changing her shoes and not a single shoe in sight! Where were the morning rule followers? I was bold and left my Keens there anyway. I thought maybe others would follow my amazing lead. I think there might have been 2 other pairs of shoes when I left. So sad. There must have been a flood of those afternoon rats who just barged right through the gym and ruined all of the machines. They have the shoe rule at my daughter's dance school too. I used to take off my shoes at the door, and then I noticed that many of the other parents disregard the rule, so I leave my shoes on now as long as they're not really wet.